Here at Flying Horse we pride ourselves on the appearance of our horses. People always comment on the lovely shiny coats and flowing tails. We firmly believe that good feed, a relaxed environment and correct training go a long way to achieving this. Regular grooming is important too. Even the horses not in work are brought in once a week for a good check over and groom. The horses in work are groomed every day and tails are washed and conditioned once a week. If sweaty after working they are hosed down and dried off. With the arrival of our latest horse Charlie, we had to rethink what we used in grooming products as he is super sensitive. His nose was cracked and bleeding while his coat was dull and lifeless. He reacted to the shampoo we usually use and came out in huge welts which added to his discomfort. So we decided to start making our own products; Julia trained at Southland Hospital as a Manufacturing Dispensary technician back when the hospital made all the creams and shampoos etc . After sourcing the high quality ingredients we set to work making various potions and testing them on ourselves! No humans were harmed in the making of our products so we know they are safe for our precious horses! Charlie is the proof that they work as he looks amazing now and his nose is covered in soft fur instead of being cracked and weeping. Contains olive oil, castor oil, NZ beeswax, vitamin E, coconut oil . Soothing and moisturising, our bit balm is great for the sensitive nose and lips. The coconut oil is a natural sunscreen and the Vitamin E is an antioxidant that assists in maintaining cell integrity helping the skin to stay soft and supple. : aqueous solution of NZ manuka and chamomile flower extract, sodium cocoamphoacetate, glycerin, lauryl glucoside, sodium cocoyl glutamate, sodium lauryl glucose carboxylate, cocoglucoside and glyceryl oleate, citric acid, phenoxyethanol. Gently cleans and brightens coats leaving them soft and silky with a beautiful shine. Contains Almond oil, Sunflower oil, Coconut oil, Argan oil, rosehip oil and jojoba oil. 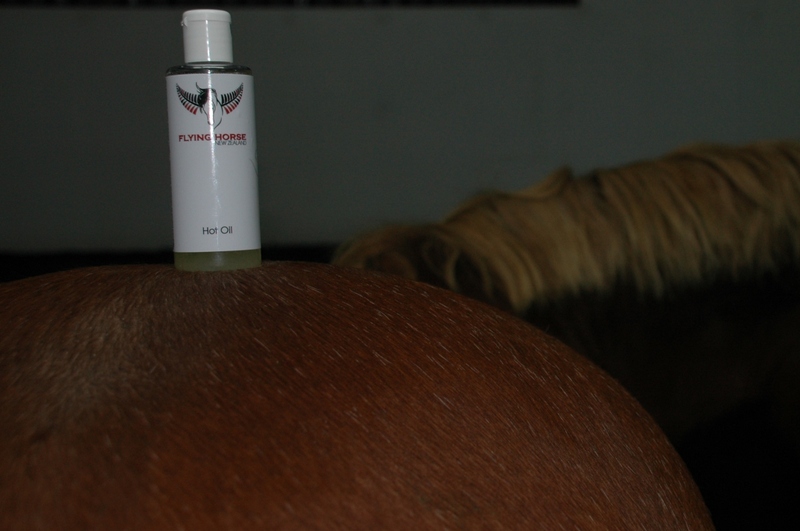 A concentrated conditioner for coats, manes and tails. Effective in restoring glorious shine to dull, dry coats, promotes hair growth and strength. Ideal for using after clipping. Use neat as face and body makeup. Every day conditioning. Add 1 or 2 tablespoons to a spray bottle filled with water to make a conditioning spray. FH Hot Oil is water dispersible so mixes easily. As a rinse:Perfect for show horses FH Hot Oil replaces the natural oils stripped from the coat by shampooing, brightens clipped coats and helps long coats to lay flat. Use between 1 tablespoon( for long coats) to half a cupful ( for clipped horses) in half a bucket of warm water. After clipping: to restore dry, dull coats to an amazing shine. Do check your horse over for any nicks or cuts before using as these may harbour bacteria which when the horse is oiled may spread and cause irritation. Intensive conditioning: to revive dry, dull or sun damaged coats use up half to 1 cupful of FH Hot Oil mixed in 2 to 5 ltr of warm water (depending on size of horse) . Using a sponge, massage into horse’s coat and scrape off excess. Tails: use 50/50 with water as a leave in conditioner.